Blizzard has partnered up with the Breast Cancer Research Foundation for a good cause. Breast cancer is no joke and the research to treat and hopefully abolish the disease is expensive. As such Blizzard has created several different in-game and other cool stuff to help the cause. The first is an in-game skin for Overwatch’s favorite nurse, Mercy. A Pink Mercy skill that’s now available now for $15, with the proceeds going to the BCRF. This is a limited time deal, so if you’re interested in it then be sure to jump on it. They’re also selling limited-edition Pink Mercy t-shirts for both men and women, priced at $30. Just like the in-game skin, all the proceeds will go toward the BCRF. You can pre-order the t-shirt now over at the Blizzard store, from now and up until May 21. Sadly, they won’t be shipped until Q3 2018. I just ordered two for my wife and daughter since they walked in and saw me writing about them. Of course, they demanded I order two the shirts for them. There’s also several in-game unlocks for everyone who logs into Overwatch starting from May 8 – 21. 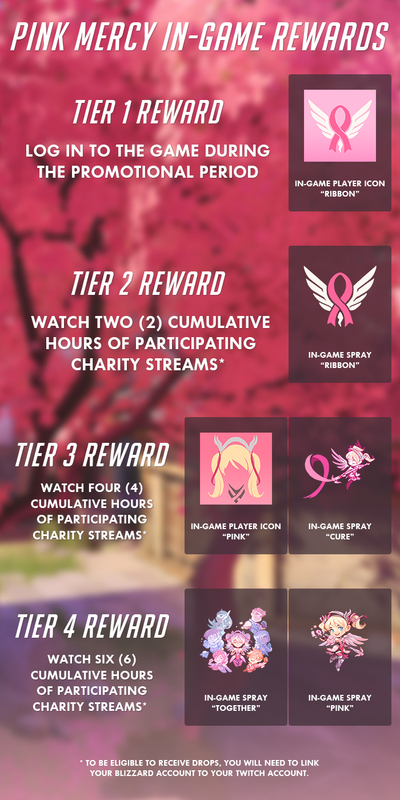 This includes a BCRF-themed player icon, as well as Twitch drops in the form of a new player icon and several new sprays. There’s even new Pink Mercy cosmetics that can only be earned by watching specific Twitch streams during the promotional period. If you want these, you’ll need to make sure you link your Blizzard account to your Twitch account. Don’t have a Twitch account, but want them? Then be sure to sign up for one, they’re free and it takes a few minutes to sign up. Below are the times where you can start earning those in-game items. Keep in mind that this is a limited time promo, so don’t miss out.